Japan is a land steeped in tradition. These customs, often centuries old, come to life in vivid detail during Japan’s numerous matsuri, or popular festivals. Traditional costumes and clothing, special and authentic food, and stunning, colorful decorations are facets of each unforgettable festival experience. The summer months are especially populated by festivals. Many are held outdoors, and favorable weather allows visitors to enjoy the celebrations both day and night. Consider the list below of some of Japan’s most popular summer festivals. What: Twenty thousand lanterns light Tokyo’s Yasukuni Shrine for the four days of the festival. Traditional food stalls offer their fare along the temple’s main alley. Attendees often wear yukata, traditional kimonos made of lightweight cotton. Floats, traditional dance, and theatrical performances contribute to a festive atmosphere. When: July 12 to 15. Where: The Yasukuni Jinja Shrine, Tokyo, near Kudashita Station. What: The Gion Festival dates back to the ninth century. It is famous for its floats, which may be 25 meters in height and weigh 12 tons. Thirty or more floats may be used, each representing a distinct neighborhood or corporation of Kyoto. The wheels that mobilize the floats are often as tall as a person. During the height of the festival, traffic is barricaded from Kyoto’s city center to allow stands and yatai stalls containing food and games to be set up. Later, traditional neighborhoods are decorated with flowers, banners, and flags, and illuminated with lanterns. The famous parade begins at the Yasaka Shrine in Kyoto’s Gion district. 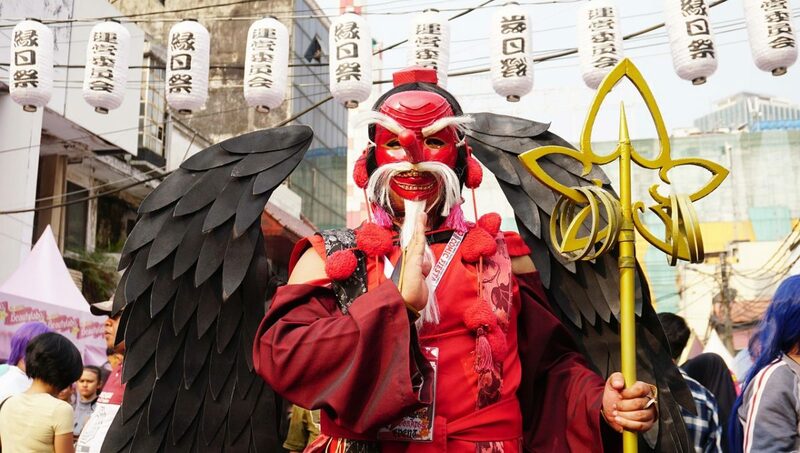 The festival received the designation of “World Intangible Cultural Heritage” event in 2009. When: The entire month of July; the most popular events occur on July 14 to 17. Where: Near Yasaka Shrine, Kyoto (buses from Kyoto Station). What: The Tenjin Matsuri is a boat festival that dates back 1,000 years. The festival is a tribute to arts patron Tenman Tenjin. Festivities involve upwards of 3,000 performers dressed in traditional attire of the 700’s through the 1100’s, who carry portable shrines, or The Tenjin Matsuri is a boat festival that dates back 1,000 years. The festival is a tribute to arts patron Tenman Tenjin. 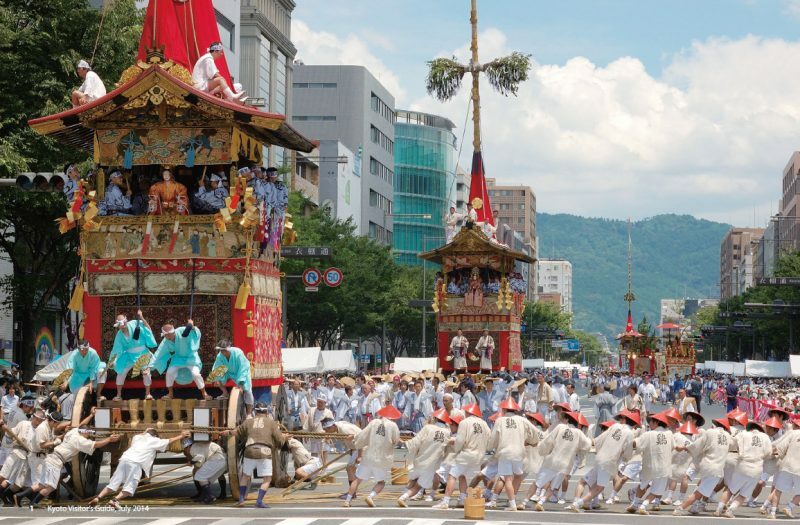 Festivities involve upwards of 3,000 performers dressed in traditional attire of the 700’s through the 1100’s, who carry portable shrines, or omikoshi, through the city. One hundred boats also set out in procession; as evening falls, fires are lit aboard the boats as fireworks light the night sky. When: July 24 and 25. Where: Near Temmangu Shrine in Osaka (next to Osakatemmangu Station). What: The Sumidagawa is the oldest fireworks festival in the world, established in 1732. 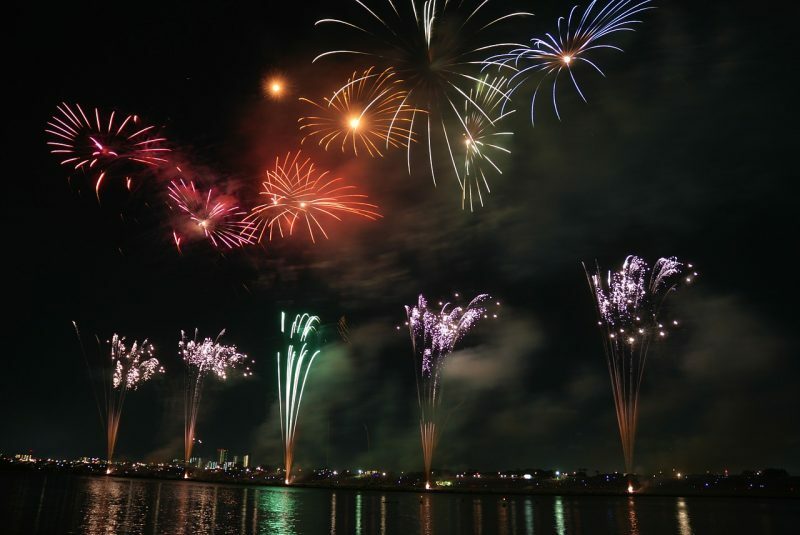 It celebrates hanabi, Japanese fireworks, and includes fireworks display competitions. The festival attracts one million attendees annually, many of whom dress in traditional yukata kimonos. When: The last Saturday in July (27th on 2019). In the event of rain, the festival will be cancelled. Where: Tokyo, on the banks of the Sumida River, near Asakusa Station and district. Sumida Park is the most popular viewpoint. The Sumidagawa festival follows the tradition of being a competition between pyrotechnic groups. What: Considered one of the top three Japanese festivals, the Nebuta festival has been designated as a “World Intangible Cultural Heritage” event. Each evening, parades of dancers carry illuminated floats. The parades last for hours, and on the final day of the festival, fireworks are lit as the floats are literally set afloat on the sea. It is thought that this festival has its origins in the Tanabata Festival, which was appropriated from China during the 700’s. When: Nightly, from August 1 to 6. What: This festival is a part of the Buddhist Obon rites, which bid welcome to the spirits of the dead. It is a holiday of family reunion when the spirits of ancestors are thought to visit household altars. Having been celebrated for over 500 years, it is one of the most famous events in the country, and boasts of being the largest festival. Each evening, the streets are awakened to the sound of drums, shamisen – a traditional guitar-like instrument with three strings – and other instruments. Bon-Odori dancers wear straw hats and yukata kimonos. When: Nightly, from August 12 to 15. Where: Tokushima, in the region of Shikoku. Where: Kawasaki, just south of Tokyo. What: Not all of Japan’s festivals are traditional; some celebrate its modern culture as well. The Summer Sonic Festival has been held since 2000 and includes performances by Japan’s most influential music artists, as well as international performers. The event is held in venues in two cities; typically, the same artists perform in each city on alternating days. When: Mid August; in 2019, the dates are August 16 to 18. Where: Summer Sonic takes place in Osaka (Maishima Sonic Park – Sports Island) and Chiba (Zozo Marine Stadium and Makuhari Messe), in the Tokyo metropolitan area. Who: Headlining artists in 2019 included Red Hot Chili Peppers, The Chainsmokers, The 1975, Alan Walker, Babymetal and B’Z. Headlining artists in 2018 included Beck, Noel Gallagher’s High Flying Birds, Chance the Rapper, Nine Inch Nails, Marshmello and Nickelback. Attending one of more of these festivals will give you a glimpse into authentic Japanese culture. Don’t neglect to use your Japan Rail Pass to travel quickly, easily, and affordably between each of the festival locations.